And we’re back! 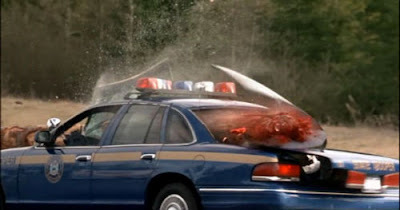 It’s time to take a look at Final Destination 2, which, according to Rotten Tomatoes’ Tomatometer™, has been critically consensed to be the high point in the series, with a Freshness rating of 47%. So you just know it’s going to be good, right? Except no, it’s not. 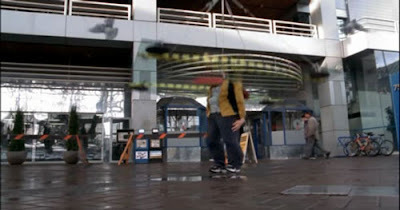 In fact, it sets up a disturbing trend which will continue into Final Destination 3: The Ghost of Murder On Ice! 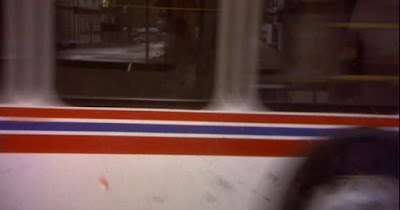 The film opens with an acknowledgement that, yes, in the world of Final Destination, people are aware of the events of the first film, and find them strange. They don’t, however, find it strange enough – the only sign we get about it being a thing people are creeped out by are a visit to a themed website and seeing an interview with a crackpot who wrote a book about the ‘Flight 180 Curse’ to coincide with the one-year anniversary of the crash. Frankly, it seems like this should be a bigger deal. The odds of being on a plane crash are long enough, but each survivor dying within the next six months, all in separate, preposterous, accidents? That’s got to be roughly equivalent to being hit by a bolt of lightning that causes you to win the lottery. And then having it happen again. For literally decades after King Tut was unearthed people talked about the curse that killed anyone involved in opening the tomb. Well this is a far-better-documented example in the present day. The press would be all over this MFer. Anyhoo, let’s get into the story proper. JJ from Criminal Minds is heading off on Spring Break with some friends, and has one of the series’ patented premonitions while waiting to merge onto a highway. 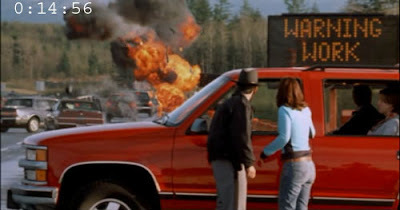 I’m going to pause here for a moment to point out something I neglected to mention in my review of Final Destination – Alex, the main character, was not involved in causing the disaster. He, like the rest of his class, just happened to be on a plane with a bad electrical system. His freak-out delayed the take-off, which meant the plane explosion happened five to ten minutes later than it would have, but since the problem was in the plane itself, there’s no reason that would have prevented the disaster. Okay, now back to JJ. While waiting, she hears a knock on her windshield. This is an old lady banging a set of cans on the window of the van. I point it out because this is the moment that JJ will fixate on as validating her déjà vu. It occurs at 4:53. So let’s gave the film the benefit of the doubt and assume that everything after this point occurs in real time, or something like it. The SUV full off teens zooms off down the highway, pulling into traffic at 5:15. They see the various other characters in the film driving in other vehicles, including Black Teacher, Druggy, Lady Yuppie, Mom and Son, and Cop. and then have a terrifying near-collision with a lumber truck driving so dangerously fast that it actually passes them illegally on the right. This occurs at 6:40 into the movie. Assuming the cars are driving a conservative highway speed of 100 kilometers an hour, that puts them 2.4 kilometers past the intersection. Now let’s go further and assume that the truck was speeding along at 110 miles per hour the entire time, right up until it passed the SUV and settled its speed to that of traffic. This would mean that the truck, in that same 85 seconds, would have travelled 2.6 kilometers. So at the time of JJ’s SUV merging into traffic, the truck would have been 400 meters before the intersection, passing that intersection thirteen seconds after she drove into traffic. I know this is a lot of math, but trust me, it will all come into play soon. Yeah, it’s possible that I shouldn’t have included the gore shot. Sorry about that. Anyhoo, the point is that we know that the chain broke at 9:45, which is exactly 270 seconds after JJ merged into traffic, and therefore 8.3 kilometers away from the intersection. So, just to be absolutely clear, the fatal accident happens nearly ten kilometers (and exactly five miles) away from the intersection where JJ’s Déjà vu began. Now let’s get back to JJ, as she snaps back from witnessing a vision her own fiery death. The old lady bangs her cans on the windshield again at 11:50, meaning that had the original timeline been allowed to continue, at 12:12 she would have pulled into traffic – this means that the lumber truck should zoom by at exactly 12:25, with the accident occurring at 16:42. This should be true, because the film continues on in apparent real-time. And yet, at the appointed time, the truck refuses to show. Not at 12:25, not at a full minute afterwards. 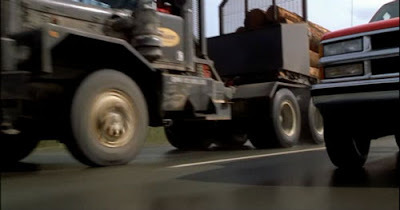 In fact, the lumber truck, which was notable primarily for the ridiculous speed it was moving at, is nowhere to be seen until 14:44, two and a half minutes after it should have been there. So here’s my question – what happened to the truck? 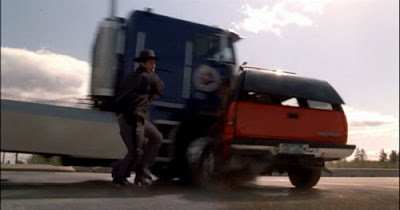 In the original timeline JJ was able to drive for nearly five minutes before the accident occurred, and now the only thing that has changed is that JJ kept the rest of the cast off the highway – meaning that there were less cars to slow things down. What kept the lumber truck? Why did the chain break early? A simple answer might be – ‘Well, the Ghost of Murder did it’, and that’s reasonable enough… except the entire series is predicated on the Ghost of Murder only stepping in to alter things after one of his plans has gone awry. After all, he didn’t try to crash the plane into the terminal to ensure everyone died, did he? No, he only picked things up a month later. 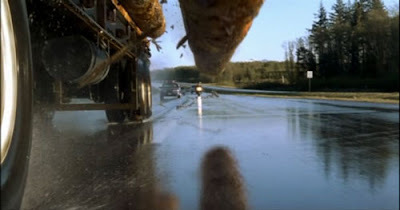 I know it’s mostly a matter of the filmmakers wanting to make sure they got more of the crash onscreen, but that shouldn’t come at the cost of logic, and it violates logic to ask us to believe that JJ’s change of mind about going onto the highway could have both slowed the logging truck down a huge amount and moved the accident eight kilometers closer to the intersection. And you know what the crazy part is? That’s not even the last continuity problem that scene has. Here’s JJ, defiantly stopping her SUV on the on-ramp to keep the rest of the cast from driving out onto the highway. It’s important to note that for the rest of the scene she does not move the car. In fact, in a few moments she’ll get out of it to try to explain herself to the cop who would have had his head taken off by the log. The important thing to note in that shot? That her SUV is well behind the highway, and parked next to a metal pole and a low concrete wall. 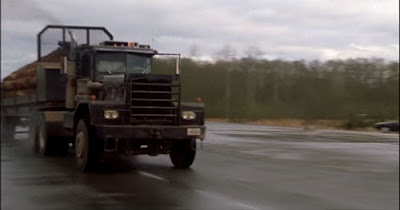 The truck appears out of nowhere to kill all her friends, somehow not smashing through the concrete dividers or knocking over the steel pole in the process. So anyway, the plot continues apace, with the cast gradually figuring out that what’s happening to them is eerily similar to what happened in the first Final Destination movie. Yup, they too are being targeted by the Ghost of Murder. Which means it’s time to stop by and visit with Clear, the sole survivor of the last movie! You heard me. Turns out Alex got killed off-camera. But before that happens the Ghost of Murder bumps off another of the survivors in a suitably preposterous series of misadventures, with the punchline being that the punk is the only person in the world so stupid that when something comes rushing at his face he doesn’t put his hands up to protect himself. The gore happens five seconds later. I’m not showing it this time. Clear, who’s voluntarily living in a padded cell, has surprisingly little advice to offer, although the scene allows the writers to get into the logic of her predicament a little. She’s so paranoid about the Ghost of Murder coming after her that she won’t come near anything even slightly sharp or heavy. Also, for some reason, she’s got a Polaroid of Alex’s corpse on her wall. It seems that, after three months of locking themselves away, the two had gone for a walk, and a brick had fallen from a building and killed Alex. And then, I guess, Clear took a picture of the body? Seriously, why does she have this? Even if the cops were willing to give her a crime scene photo (which I suppose it must be), she’s in an asylum, and whether it’s voluntary or not, there’s got to be a doctor there trying to treat her. One that must think that keeping a picture of her dead boyfriend’s bloody corpse lying around might not be the best thing for her continued mental health. In the end she agrees to leave the asylum and try to help JJ solve this conundrum. Their first stop? Tony Todd’s funeral home, of course! Because this movie is taking place really close to where the first movie was set. For reasons that will soon become apparent. Anyhoo Tony doesn’t have a lot of hints to offer this time around, just letting them know that if the Ghost of Murder is to be stopped, it will be by having new life that wasn’t part of Death’s plan come into existence. They jump to the conclusion that, since there was a pregnant woman involved in the pileup, their quest must be to make sure she has the child – new life invalidating the Ghost of Murder’s scheme and all. So now they have to round her up and make sure she survives long enough to have the kid! And there’s even a ticking clock, because JJ is now having visions of a white van (like the kind the pregnant lady drove) ditching into a lake! But first it’s time for some more gruesome murders, which call into question both how the Ghost of Murder’s rules work, as well as what we, the audience, are supposed to accept as reasonable human behaviour. First, the Ghost of Murder stuff. The teen is brought to the dentist by his mother, and while there, a preposterous series of events happen – preposterous, Rube Goldbergian deaths being the Ghost of Murder’s trademark, we can only assume he’s involved – almost killing him. A fish gets trapped atop one of the tank’s vacuum pumps, which causes a leak, that drips onto an outlet which makes the power in the office go wonky, cutting off the oxygen supply to his Nitrous/Oxygen mix, almost knocking the kid out, so that when a plastic blowfish from a mobile falls – with no outside force acting on it – right into his mouth, the teen’s breathing is cut off. It looks like he’s a goner until a nurse rushes in and plucks the toy from out of his windpipe, saving the day! Wait, what? What happened to the rules, Ghost of Murder? There was a preposterous series of wacky coincidences, partially caused by a supernatural force, that would have led to his death, had someone not intervened. Isn’t that the criteria? Shouldn’t the Ghost of Murder skip him now? And then his death, with the pigeons and the lever, has nothing at all to do with the near-death experience in the dentist’s chair, such as, oh, I don’t know, him spitting out the blowfish doll and having it land outside where then he trips on it, falling into the pigeons. No, as it stands they’re supposed to be two wholly unrelated incidents, which means his first ordeal wasn’t caused at all by the Ghost of Murder – which flat-out makes no sense at all, given how ridiculous the whole thing was. But let’s move on to the just flat-out stupid one. After a surprisingly non-fatal car accident the yuppie is trapped in the front seat of the car. Want to guess what happens to her? The kicker of this scene is how they want it to be shocking – a guy goes to pry open the door with the jaws of life, and that impact somehow sets off the airbag, pushing her head into the pipe. As if someone stuck in a car like that – but in no immediate danger - wouldn’t say “You know what? Before you worry about getting the door open, how about we move that jagged bit of PVC away from my neck, huh?”. But they don’t, and it somehow ends up through her forehead. Even though she could have just leaned to the side in the seat before they tried to pull her out. Wow. That scene’s been bugging me for like seven years. 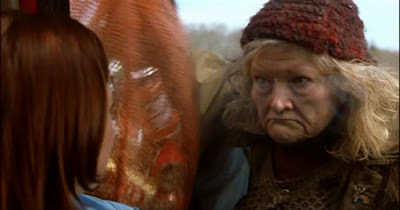 No wonder I never watched this movie a second time before now. You know what? Now’s as good a time as any to explain the big twist this movie brings to the mythology, since it comes up in the drive leading up to the car accident. What’s the new wrinkle? That instead of killing people in the order they would have died, the Ghost of Murder is now killing people in reverse order. Why is he doing this? Well, it seems that each member of the cast has previously been touched by the hand of death – every one of them avoided getting killed at some point in the past year because they were somehow affected by the survivors of the first film. The cop didn’t get shot because he was called to the scene of a train accident, junkie wasn’t in a theatre that collapsed because he saw Gay Jack get hit by a sign, and, in a much less dramatic incident, JJ wasn’t carjacked to death because she was delayed from following her mom out of a mall by a news broadcast about Tod’s suicide. So what the Ghost of Murder is now doing is cleaning up the loose ends he created with his last killing spree. But wait, why does that mean he has to do the murders backwards? What’s that? For no reason? Oh, okay. As long as there’s no reason, I’ll just keep going, I guess. Two things about this late-film twist, though. 1: It’s nice to see that, like the missing trap rooms from Saw II, the writers didn’t come up with any story they didn’t have to, and don’t bother to explain why the already-dead characters needed to go. Hell, they don’t even suggest whether JJ’s three friends needed to die in the accident, or if they just suffered for making the poor decision to get into a car with her. And why would you take that to get to a rural B&B? Eben more preposterous is the Black Teacher’s story, who explains that he was transferred to the school from the first film after dead teacher was killed by hilarious contrivances, and then two days later someone stabbed his substitute at the old school. Here’s the problem with his story, though – and it’s twofold (man, this is like the eighth multipart problem in a row for me. Weird.) based on just when the transfer happened. If the transfer was A: Supposed to be right after her death, the story is just nuts, because school is clearly out when the first film takes place. The characters’ two-week-long France trip must be taking place either at the very end of the school year, or in the summer (the real one was in July), and then the main action of the film takes place a month later, and none of the characters are going to school at that point. So when she got killed the teacher was absolutely not currently teaching a class that would need someone to cover it when she died – hell, she was a few days away from leaving town when the Ghost of Murder came calling, and she no doubt would have put in her notice. But let’s give them the benefit of the doubt and assume they meant B: he was transferred at the beginning of the next school year, and that’s when the stabbing happened. Even then it doesn’t make sense, because think about what the teacher’s death changed – if she’d died on a plane, they would have had a substitute come in for the last week of school, then transferred (or hired a new) teacher for the fall. If she’d died in a house explosion after being stabbed by bad luck, the board would have had to… hire or transfer a teacher for the beginning of school. Meaning that in either case, Black Teacher would have wound up teaching that class at approximately the same time, and her death didn’t effect him at all. So either the writers didn’t think this one through too well, or the Ghost of Death is getting sloppy. Of course, given the fact that he deals with a few people he doesn’t like with large-casualty tragedies rather than, you know, brain aneurysms, suggests that he’s not the most careful artisan anyhow. So, with that out of the way, the rest of the survivors convene at the hospital in time for the baby to be born. But that doesn’t change anything, and the Ghost of Murder bumps off Black Teacher and Clear in a single explosion. Why didn’t the baby help things? JJ has a quick flashback to the accident, and realizes that the pregnant woman wasn’t killed in the original accident, and has no involvement in the Ghost of Murder’s plan! So what could Tony Todd have meant by ‘New Life’ breaking the plan? Well JJ takes the comment, along with her visions of drowning in a lake, to mean that she should drown herself in a lake, thereby ‘dying’ since it’s her turn, and then have someone resuscitate her so that ‘New Life’ is created. Um, is that technically new life? Of course, a 9-month-old fetus is already alive by any definition, so it’s hard to imagine how it being born would count as ‘new life’ either. Yeah, the film basically falls apart right at the end. The Ghost of Murder is foiled by JJ coming back to life (even though it’s not really her turn because no one ever got around to saving, and therefore making him skip, the cop), and we’ve got a happy ending. Perhaps the only one in the entire series, although I can’t speak to that because, at the time of writing, I have yet to see part 4. Next up is part 3, the one that takes my biggest problem with part 2 (the accident changing the way it happened for no reason), and turns it up past 11.